Seated at a square wooden table next to the fireplace, two middle-aged men were engrossed in low-toned conversation. They were thankful that the harsh weather had emptied the tavern, which otherwise afforded spectacular Allegheny Mountain Range views in every direction. After finishing a dinner of Southern fried chicken with yams, the first man slowly removed his eyeglasses and began cleaning them. The second man picked up his brandy snifter, swirled the golden liquid around and set it back down on the table. 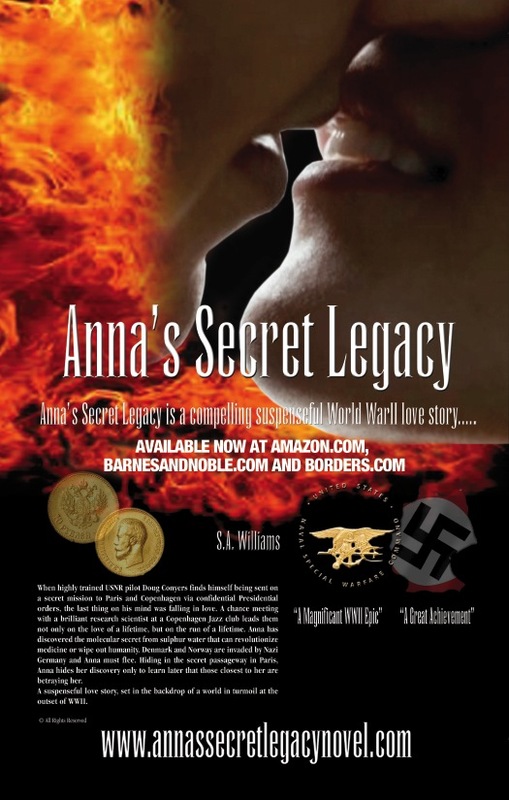 This entry was posted in Anna's Secret Legacy, Anna's Secret Legacy Blog, Annas secret legacy novel, Barnes & Noble, Book Signing, Borders, NJ, Pilots, Pressroom and events, Scientific Discovery, spies, Uncategorized, World War II. Bookmark the permalink.